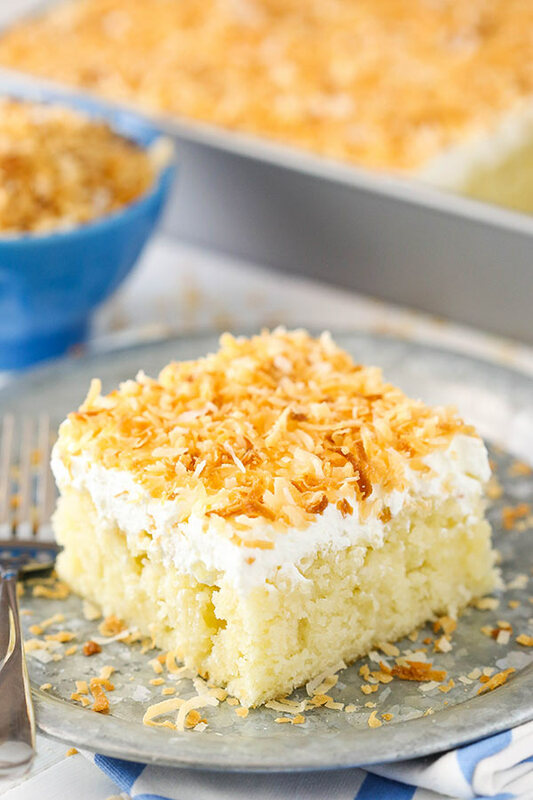 This Coconut Poke Cake is a from scratch coconut cake soaked with sweetened condensed milk and cream of coconut, then topped with coconut whipped cream topping! It’s a coconut lover’s dream! So if you’re a subscriber to my email list and get emails with each new post, then you may remember getting an email in December with a survey about what you’d like to see in 2017. I got such a great response and am SO thankful that so many of you took the time to respond. Yes, there was a giveaway involved, but still. 🙂 The feedback was awesome and there were quite a few things that many agreed on – videos, some flavor suggestions, etc. So yea, today I begin to fix the lack of coconut. And I started with this super simple and oh-so-easy poke cake. It’s pure coconut all the way. Lot’s of coconut, a bunch of flavor and ready in a flash! 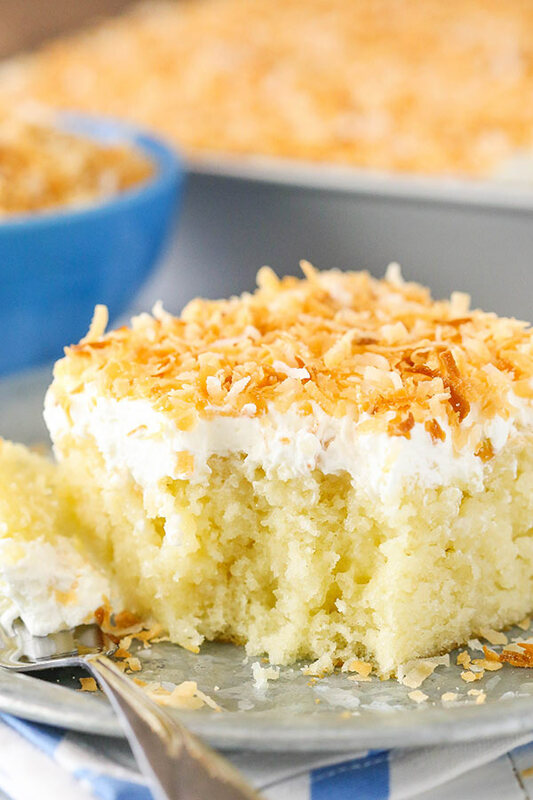 If you need a coconut fix, this is your cake. To begin, there’s the coconut cake. It’s totally from scratch, but you could use a box mix if you prefer. Truthfully though, there shouldn’t be any need to. This is basically the easiest cake to put together. Mix together the dry ingredients and wet ingredients separately, combine them, add some water, bake. Bam! You’ve got a super moist and fluffy, delicious cake! Poke the cake with holes all over (hence the name “poke cake”). I use a big knife sharpener rod – it’s super old school and I don’t even know where I got it – but it’s the best poke cake tool ever. You could use a straw, the end of a spatula handle, whatever you have handy. Just get some holes in there. 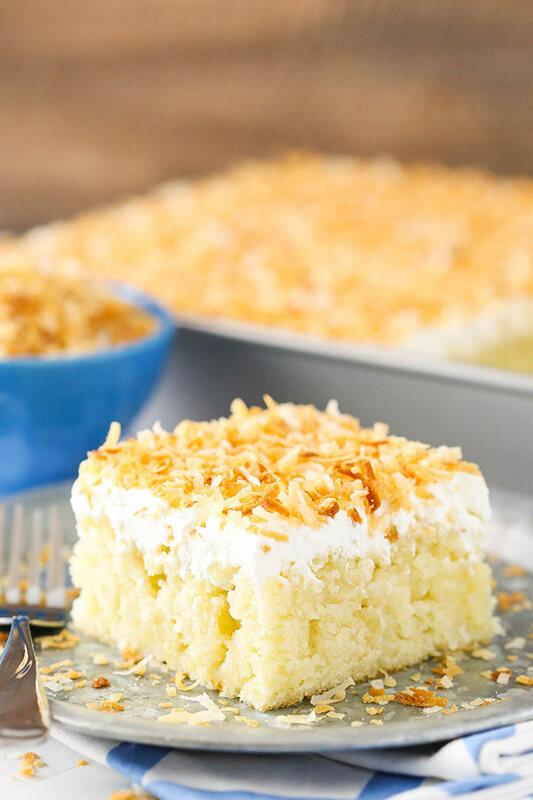 Combine some sweetened condensed milk and cream of coconut and pour the mixture over the cake, spreading it all over to make sure some goes in all the holes. 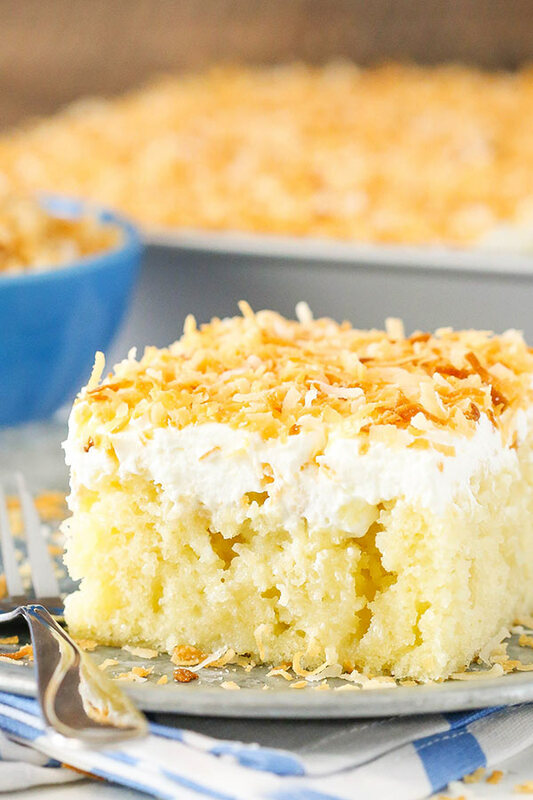 This gives the cake even more moisture and even more coconut flavor. I love it! It’s one of the best parts of a poke cake – so moist it’ll stay awesome for daaaayyyssss. On top of the cake is the homemade coconut whipped cream. Again – super easy. Toss everything in a bowl and whip until you’ve got stiff peaks. You could go the easy route and use a ready made whipped topping and add some coconut flavor, but once you’ve made homemade whipped cream you probably won’t ever go back. Just sayin’. 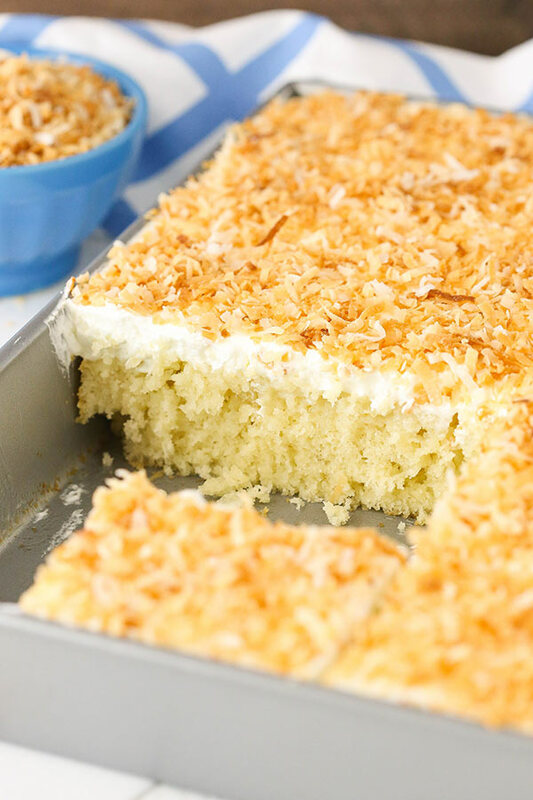 The cake is topped off with some toasted coconut for extra flavor, texture and because it’s pretty. 🙂 The final cake is to die for! So much coconut, so little time. Grab a fork and dig in! 1. Preheat oven to 350°F (176°C) and prepare a 9×13 inch cake pan with non-stick baking spray. 2. Add the flour, sugar, baking powder and salt to a large mixer bowl and combine. Set aside. 3. Add the milk, vegetable oil, coconut extract and eggs to a medium sized bowl and combine. 5. Slowly add the hot water to the batter and mix on low speed until well combined. Scrape down the sides of the bowl as needed to make sure everything is well combined. 6. Pour the batter into the prepared cake pan and bake for 28-30 minutes, or until a toothpick comes out with a few moist crumbs. 7. Remove the cake from the oven and poke holes all over the top of the cake. 8. 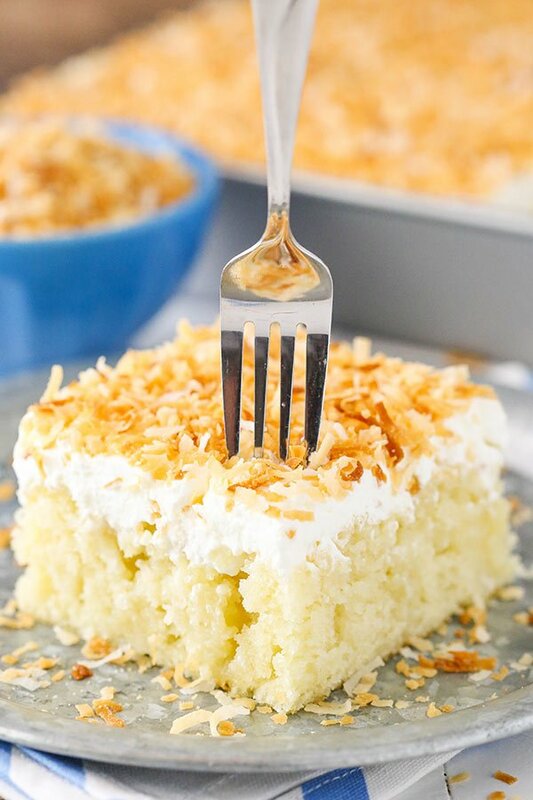 Combine the sweetened condensed milk and cream of coconut and pour over the top of the cake, allowing it to soak into the holes. Let cake cool completely. 9. To make the whipped cream topping, place the heavy whipping cream, powdered sugar and coconut extract into a large mixer bowl. Whip on high speed until stiff peaks form. 10. 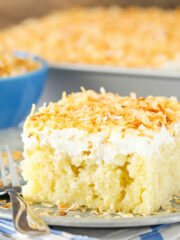 Spread the whipped cream over the top of the cake and cover with toasted coconut. 11. Refrigerate the cake until ready to serve. Cake is best for 3-4 days. I made this beautiful cake yesterday for my daughters birthday and she loved it! We all loved it. This is a keeper recipe I know I will make over and over! Thank you for a wonderful recipe! I’m so glad you enjoyed it! Thanks Lisa! I have made the this recipe using cake mix. 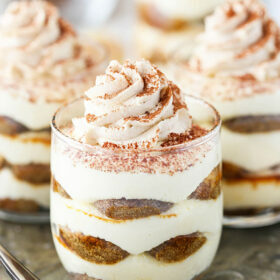 This has to be delicious with a scratch cake and real whipped cream. Looks so pretty! Oh wow oh wow oh wow. You had me at coconut cream. Unfortunately, my family doesn’t like coconut, so I’d have to eat this whole cake by myself. Not saying that’s a bad thing…. Hi there! could I substitute the vegetable oil with butter? I haven’t tried it with this cake. Not sure. I don’t believe they are the same, but there are a lot of similar things out there. The cream of coconut I used is the one usually found near the drink mixers. 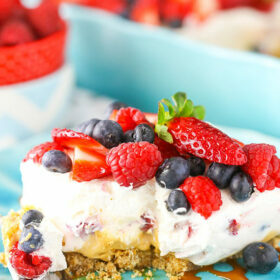 HI Lindsay – I sure is beautiful and looks super delicious – but 2 cups of sugar and a can of sweetened condensed milk is too much – We enjoy desserts and I make them often but try to make each one a bit healthier – any way cutting down on the sugars in this recipe would still yield a moist and delicious cake? You could certainly forgo using the sweetened condensed milk. 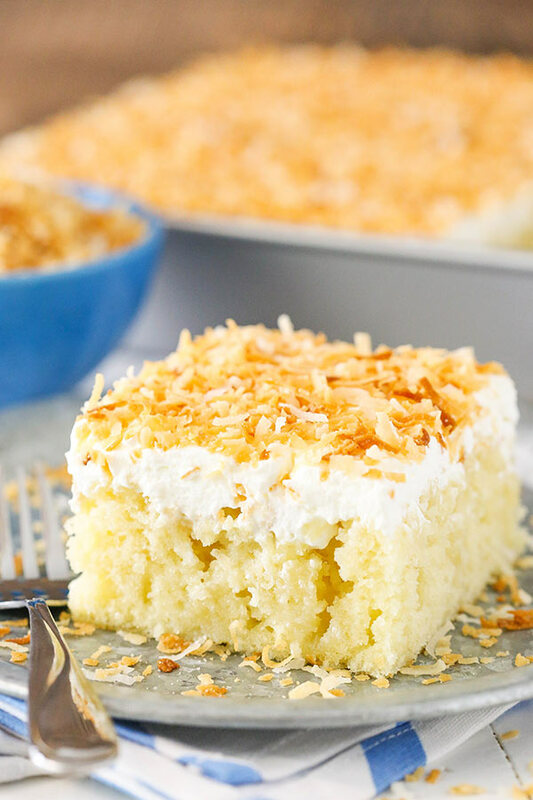 You could add some extra cream of coconut to soak the cake or just leave it out. The cake is even delicious on it’s own. It’s usually in the area of the grocery store where the wine, beer and drink mixers are. You can also find it at the liquor store. Could you use milk in place of the hot water?? Is there a certain purpose for the “hot” water or could you use any type of ‘liquid”?? Thanks! I haven’t tried replacing the water with milk. It will likely change the texture a bit since water is purely moisture and the milk contains fat. I find that a little water, as opposed to more milk, makes a lighter cake. Do you have to use coconut extract or would vanilla extract be ok? I know the coconut extract would add more coconut flavor. What about substitution Malibu rum for the coconut extract? Looks delicious! Would like to try it tomorrow for my MIL’s birthday! She loves coconut! Either would be fine – as you mentioned it’s all about the amount of coconut flavor. You could try subbing in some coconut rum for some of the water in the cake. Is the batter supposed to be thin? Yes, it’s a very thin batter. I made this recipe for Father’s Day this past weekend. It was perfect and got rave reviews! I ALWAYS bake cakes from scratch. Don’t be alarmed by the thinner than normal batter after adding the hot water. It baked up perfectly. And for the person asking about substituting butter for the oil, I did exactly that, and it turned out great. This is NOT for someone looking for a healthy dessert. I think you would ruin it by trying to skinny it up. But we all need an indulgence now and then. Thanks for sharing this amazing recipe. I’m so glad you enjoyed it, Amy! Can I make this az a regular 3 layer cake?? I want a pretty coconut cake for my mom. It might be easier to follow this recipe and replace the pineapple filling with additional coconut frosting. Can i use this recipe in a cupcake or a 6″ or 8″ round cake pan. Yes, it can be make into cupcakes. It will also bake well as a cake. I’ve made three 8 inch cake layers in the past and baked for about 24-28 minutes. The poke cake as a layered cake may not be quite a stable with all the moisture, but you could try it. Do you poke the cupcakes? Or do without the coconut milk and cream of coconut? Hi Lindsay! Is this cake same as Mexican “tres leches cake”? No, poke cakes are similar, but this one is not the same. I just made this cake for my mother in law’s birthday and it was a hit! Will definitely be making this again. Thanks! Just made this and it was a huge success. Thanks Lindsay! Can coconut emulsion be used instead of coconut extract? I haven’t really used coconut milk before, but I believe they are probably a bit different in consistency and flavor. You could certainly try it, I’m just not sure if it’d give the same flavor to the cake. If i may ask, is the end result will be super sweet? if i cut the sugar amount, will it change the cake texture? I don’t find it to be super sweet, but that’s probably a preference thing. You could try reducing the sugar, but reducing it by too much would likely affect the texture and moisture of the cake. How can I make this into a three layer cake instead of a sheet cake? Check out this cake – it’s the same but vanilla. Just swap out the vanilla for coconut and you’ve got the same cake in three layers. I took a gamble and used this cake recipe for cupcakes. They turned out PERFECTLY! I know I’m *very* late to the party, but after making your Lemon Cake with Bavarian Cream TWICE (it was so good, I had to make a second one a week later), I am HOOKED on your website! You’re such a talented baker, and your blog posts are a joy to read. Can’t wait to buy your cookbook! Thank you!! Thanks so much Brie! So glad you enjoyed them!